Illustrator, furniture-maker, and all-around Renaissance man of arts, Ken Dubrowski does everything by hand. For 20 years, he was a freelance illustrator for newspapers, magazines, and business customers. As publications moved away from using original drawings to stock illustrations, Dubrowski decided it was time to turn his hand to other arts. As a custom furniture maker, painter, and landscape designer, he now provides “artistic solutions’’ to customers’ needs. “I’m a problem solver for people who want artistic solutions,’’ Dubrowski said last week from his Marshfield studio. Dubrowski’s studio has evolved into “a modern Renaissance studio,’’ said Kate Sotolova, the manager of the South Street Gallery in Hingham, which is showing an exhibition of his illustrations and handmade furniture. His studio, open by appointment, showcases his collection of house portraits, murals, and limited edition prints, along with original color illustrations and furniture pieces. Dubrowski’s solo show at South Street is an unusual exhibition for a gallery specializing in plein-air landscapes and seascapes, Sotolova said, and the desire for something different was behind the gallery’s decision to mount it. The colorful framed and matted illustrations, exhibited along with the titles of the stories they illustrated, catch the eye. And the classic American designs of his furniture appeal to a historic region’s taste, Sotolova said. “Hingham is very traditional. This type of furniture would fit in well with the homes here,’’ Sotolova said. A native of New Jersey and a graduate of Hartford Art School, Dubrowski shopped his illustrations to magazines and developed clients. His illustrations appeared in such publications as The Washington Post, The Boston Globe, The New York Law Journal, and in publications for businesses such as Sprint and Merrill Lynch. The illustrator boils a story’s ideas down to an image “to engage readers and get them to read the story,’’ he said. 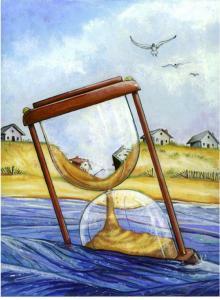 An illustration for a Delaware magazine’s piece on beach erosion (“The Slow Erosion of Our Beaches’’) depicts an hourglass floating along a picturesque shoreline. An illustration in demand today depicts well-dressed men prancing greedily on a surface of oil slicked water, drill rigs looming in the background. Dubrowski drew this image of the relationship between wealth and oil spills a few years back — and online media want it now. As the market has changed in recent years, the artist moved to “other venues of art’’ and made traditional furniture from Shaker and other designs, either finished as new or with a “distressed’’ and antiqued finish. Among the 15 furniture pieces made of cherry or pine on exhibit at South Street Gallery are a Shaker dry sink and a Shaker jelly cupboard — spare, functional, beautiful pieces. “I love the simplicity of Shaker furniture,’’ he said. A few years ago he decided that his “next progression’’ was plein-air painting and taught himself to paint this way — outdoors, on location. He now paints house portraits and wall murals for customers. He learned landscape architecture as well. When Dubrowski, his wife Arlene, and three daughters moved to Marshfield, they found a property with “rotting trees and chicken wire.’’ Dubrowski designed and constructed an elaborate deck that fits organically into the landscape, built a stone stairway, and began a stone wall that now wraps around the yard. “I love gardens,’’ he said. His garden has been a 10-year project, but the resulting transformation of the landscape is a validation of the artist’s approach. “I’m a better artist because I am able to incorporate all the elements of these artistic abilities into one package,’’ Dubrowski said. Open Tuesday through Saturday, 10 a.m. to 6 p.m.